The 2011 RC44 World Championships came right down to the wire and the final race. 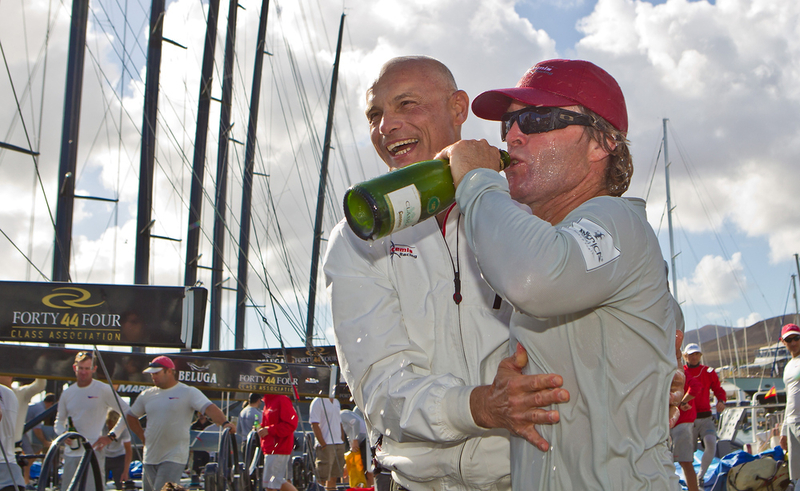 Katusha made a late comeback, but Artemis Racing held their nerve and two new teams made it onto the podium for the first time this season. It was Katusha (RUS), steered by Steve Howe this week with Francesco Bruni calling the shots, who relished the windier conditions in Puerto Calero. 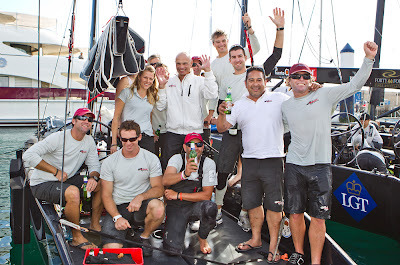 The team did not put a foot wrong, as the wind touched 23 knots at times, storming to victory in every race. 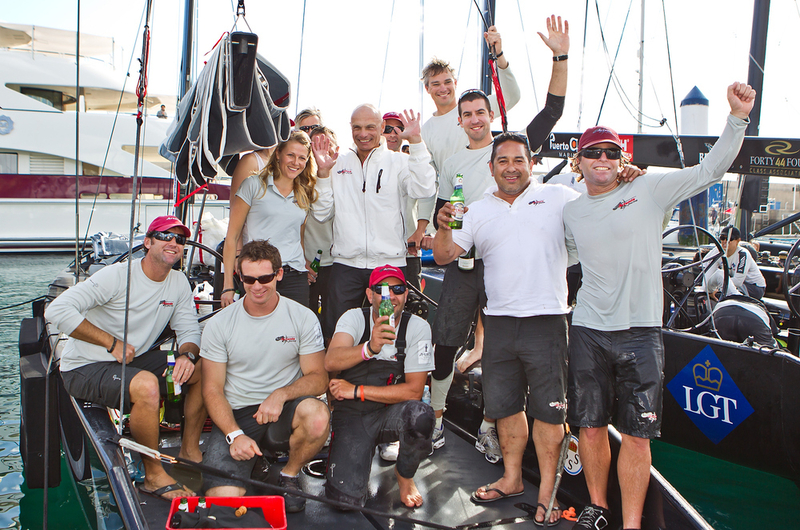 But even three wins was not enough to topple Artemis Racing. The Swedish team slotted in a fourth and then a second giving themselves a six point lead going into the final race of the Championships, to be assured victory they needed to finish in the top seven in the final race of the day. They started well but as they approached the windward mark they had it all on, Ironbound were pushing Katusha for the lead and Artemis Racing were eighth. By the finish Torbjorn Tornqvist, Morgan Larson and the team had gained one place to seventh, enough to give them the title by two points. “It’s great to finish the season like this, we had a good regatta, it was tight racing and an exciting event but it got a bit scary in the end. It wasn’t until the last round before it was clear where we had come. We were lucky we had consistent good team work and I’m really happy with the team. Next year is a new season, hopefully we will be able to sail with the same team, like we did last season, and be able to pick up from where we left off,” said Torbjorn Tornqvist, owner/driver Artemis Racing. David Murphy (USA) was clear about intentions in Lanzarote, they wanted not just to be on the podium but to win. That is very nearly what the Ironbound team did. They went into the final day in third, five points off the lead. By the end of the day the American’s had closed the gap to just two points, enough to give them second. Peninsula Petroleum the team from Gibraltar had topped the leaderboard on day one and then stayed within reach of the title throughout the event. Their fourth place in the final race of the day assured them a place on the podium. 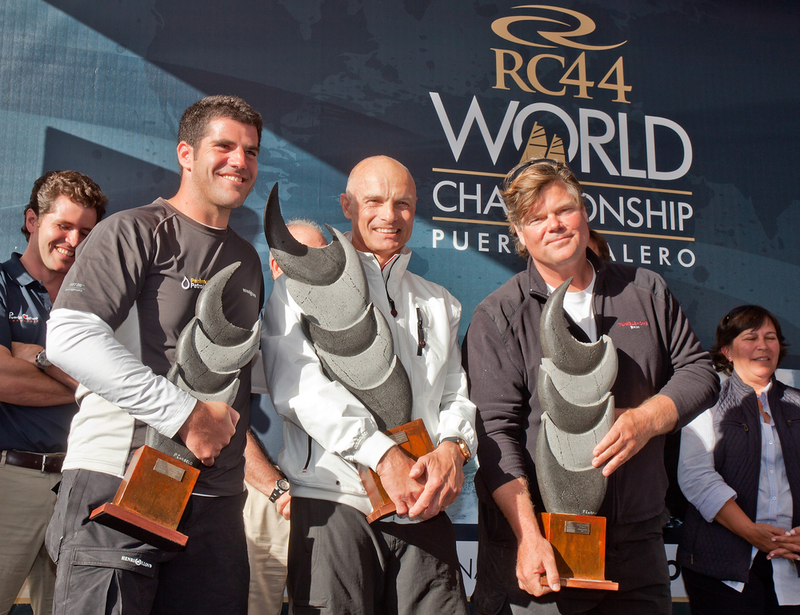 The RC44 World Championships also doubled up as the final event of the RC44 Championship Tour. 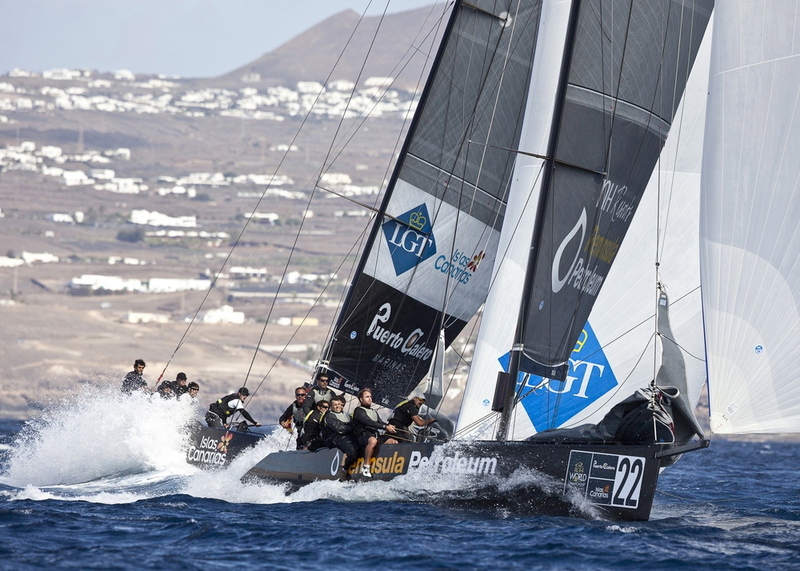 With Team Aqua already securing the 2011 Championship Tour title, Artemis Racing needed to win in Lanzarote to secure second. So Puerto Calero ended up as a double celebration for the Swedish team, World Champions and second in the 2011 Championship Tour. Third place went to ORACLE Racing, even though the team were not in Lanzarote, their consistent season was enough to give them the final podium position. 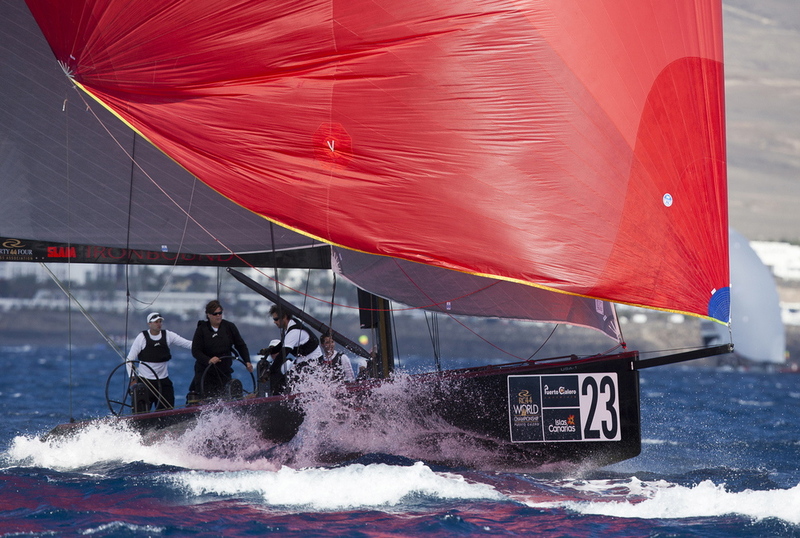 It is the fourth time that the Calero family have welcomed the RC44 class to their beautiful venue. Puerto Calero delivered a fantastic event and sailing for the competitors and guests alike and the class are looking forward to returning next February for the first event of the 2012 RC44 Championship Tour. 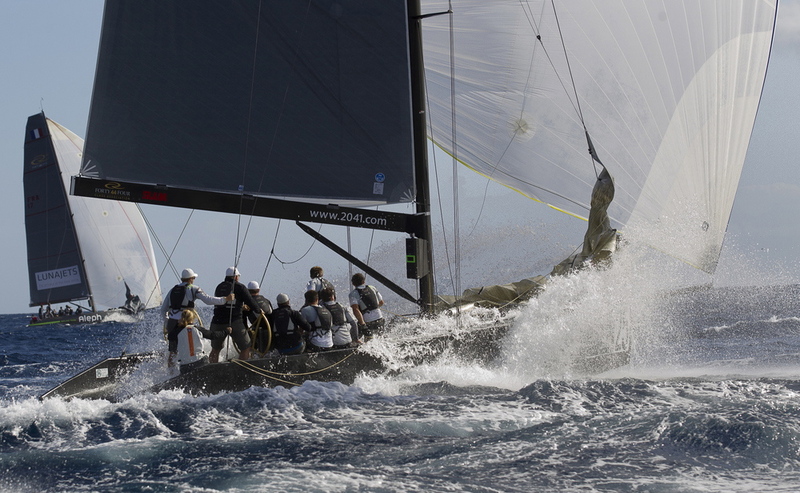 The full list of venues for the 2012 RC44 Championship Tour will be announced in the coming weeks.